No bells? No vice principal? No state standards written on the whiteboard? Students rigorously engaged in hands on projects and exhibitions of student work pulling in over a thousand visitors? How does it all happen? High Tech Middle School (known as HTM) is a 6-8 public charter school located in San Diego, CA. The school is nestled in the uniquely designed buildings of the old NTC (Naval Training Center) at Liberty Station. Even today, walking along the corridors of this historical site, built in the 1920s in the popular Mission Revival style, one gets a sense that something groundbreaking is developing within its walls. HTM’s building is open and airy, with a vast amount of indirect light pouring through windows and skylights. Artwork and student projects line the main corridor and invite visitors to peruse the walls like walking in a museum. HTM opened its doors in the fall of 2003 as a spin-off of High Tech High. High Tech High was founded by Larry Rosenstock in 2000 and was founded on the research that he and colleague, Rob Riordan, has conducted in urban Massachusetts schools as part of the Harvard School of Education. HTM is one of five schools located on the charter’s campus, affectionately referred to as “The Village.” Students come from all over San Diego County to attend HTM. The school hosts approximately 300 students who enroll through a lottery system that generates a balance of San Diego zip codes. At HTM you will find students from Barrio Logan and La Jolla working side by side. The only priority enrollment is that given to siblings and students graduating from a feeder school, Explorer Elementary (located next door). High Tech Middle’s curriculum (like its sibling schools) focuses on covering content through all-encompassing projects. 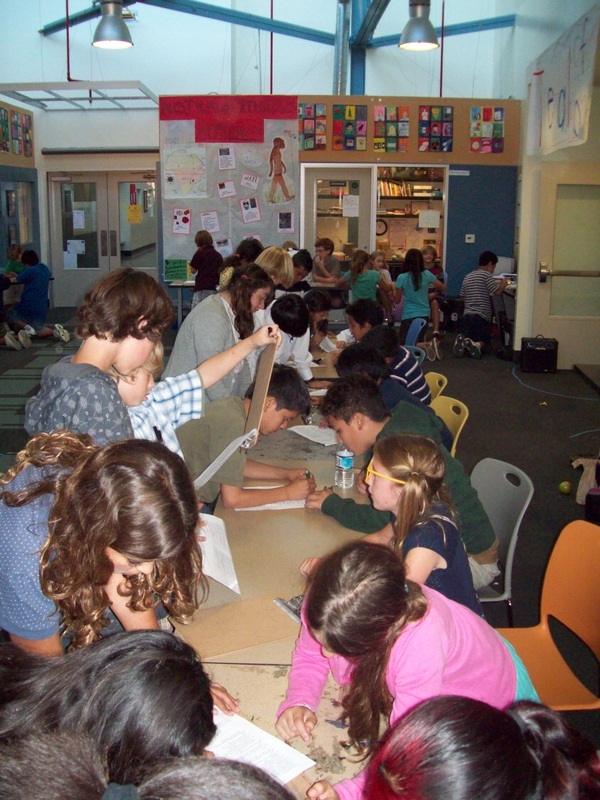 The school adheres to a Project-Based Learning philosophy. The High Tech schools were founded on the following six design principles. Teachers provide students with unique projects taylored to their abilities and interests. HTM strives to prepare students for the real world through projects that connect them with professionals and specialists as mentors and an audience for their work. High Tech Middle does not track students and promotes an inclusive classroom where students of all learning styles and levels learn together. Teachers at HTM are given almost 100% autonomy to create and carry out projects. They work in teams of multiple disciplines to design cross-curricular projects. HTM is a school of choice. Students, with the support of their families, apply to the school. These families typically continue to provide academic support once enrolled. The High Tech schools strive to achieve a 60/40 mix. This number means that 60% of the students come from backgrounds valuing education and help establish a positive school culture. The 40% are students from under-privileged or socio-economically challenged areas of San Diego. Many of these students have come from public schools typified by negative school culture and a low value placed on academic success. Larry Rosenstock has explained that if the majority of the population promotes the idea of academic success and positive school culture, the minority will be influenced to conform to that culture. HTM is a small school. With slightly more than 300 students, every child gets a sense of being “known” at the school. The small community makes it easier to facilitate the school-wide sense of respect and accountability. High Tech Middle is a teacher-run school with a director acting as facilitator and liaison to parents and the school board of directors. The director fulfills the traditional duties of a principal, VP and sometimes school counselor. Almost all decision-making is transparent and involves teacher feedback. There is an emphasis on meetings (3 a week) that involve professional development, addressing school-wide issues, brainstorming and tuning projects and working together. Collaboration is second nature to High Tech teachers. Over the last several years there has been some debate regarding the frequency and type of meetings and the protocol for making decisions. Currently, the staff is encouraged to make consensus decisions. This sometimes lengthy process is promoted as a way to ensure that everyone feels valued in decision-making and that the staff does not become divided by majority votes. Change and innovation is a common theme at HTM and generally accepted by the staff as a strength of the school. Most recently the staff decided to remove one day of advisory and add a day of X-Block (an elective class in the afternoon). Additionally, each grade level is experimenting with new schedules that allow the exploratory teachers (drama, art & Spanish) to teach 2 hour blocks at least once a week. Teachers at HTM share a lot of passions and have a lot of fun together. There is definitely a work hard, play hard ethos among the staff. The sense of friendship and community shared by teachers helps foster a positive, energetic and inspired work environment. While achieving a balance of students from all zip codes, HTM’s demographics are slightly different than than the surrounding school districts. Nearly ⅔ of the school is comprised of white students, while Latino, Black and Asian students make up the other third. Free and reduced lunch students comprise 30% of the student population. Compared to the surrounding San Diego Unified School District, HTM serves half as many free and reduced lunch students and twice as many white students. However, the trend over the last 5 years shows an increase in Latino and FRL enrollment. I teach 6th grade humanities at High Tech Middle. There are approx. 112 students in HTM’s 6th grade. They are split into two teams of approx. 56. Each team is taught by three teachers (Humanities, Math/Sci and Exploratory [which is Art or Drama depending on the semester]). These three teachers collaborate on projects as a team (although the degree of collaboration varies depending on interest and subject). On a typical day a student will have two hours of Humanities, two hours of Math/Sci and 1 hour of Exploratory. Each teacher runs an X-Block (or elective class) at the end of the day during 6th period. These elective classes range from football to music or even magic tricks. Students choose the class based on their interests. Every classroom at HTM is completely different, catering to the teacher’s tastes or the kinds of activities taking place within. My classroom is typically composed of seven table clusters (seating 4 students) in order to facilitate collaboration in group projects. My classroom is most easily described in four ways (following the four walls). This year I’ve arranged my class to feature two “fronts.” One side features an interactive, multimedia whiteboard with permanent posters like our “Homework Tracker” and “Humanities Assignment Sheet” along with exemplary work of students. This serves as my direction-giving and direct instruction zone. While the opposite wall is an enormous white board that folds accordion-style to open up and allow my classroom to join my math/science partner’s room. The white board wall typically hosts the daily agenda and serves as a home to many of our brainstorms and notes. The far side of my classroom is devoted to a multimedia/computer cabinet, library, and project cubbies. The wall closest to the classroom’s entrance serves as a row of cabinets and a sink. Some cornerstones of our class reside in this area: The What Did I Miss? File, This Week’s Work, Area 51 (a place for no namers and lost items) and Papers for Mr. Shaddox (a tray for collecting work). I see each group for approximately two hours daily. It’s really hard to describe a typical day, as the flow and procedures constantly evolve with the current project. Our two hours is usually divided in one of two ways: 1) One hour of literature and one hour of project, or 2) Two hours of project time.